What Do Employees Value Most in Their Job? Employees prioritize fair pay and fair treatment from employers far more than their company’s social impact. Clutch surveyed 540 full-time employees from businesses of all sizes to determine the most important workplace attributes. The report suggests that companies should compensate employees well, reduce stress, and provide ethical leadership to recruit and retain employees. Workplace values are essential to recruiting, retaining, and motivating quality employees. If staff needs are met, companies can expect a happy and engaged workforce. But when a business falls short on workplace values, staff disengage and produce lower-quality work. According to the polling and research company Gallup, companies with disengaged workers suffer from 16% lower profitability, 18% lower productivity, and 37% lower job growth. Organizations with engaged employees, however, receive 100% more job applications. Clutch surveyed 540 full-time employees of all ages, at companies ranging from small businesses to large enterprises. We discovered that employees rank competitive pay and fair treatment as the two most important attributes in a job. Businesses can use this report to learn what employees value in the workplace and how to create a supportive environment that generates superior results. 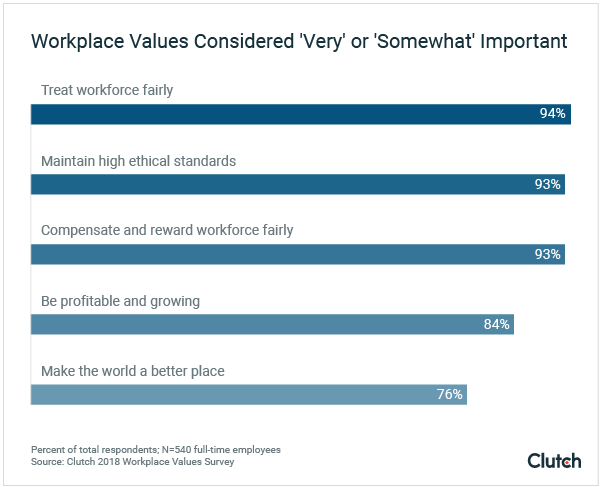 The most important workplace values for full-time employees are fair pay (55%) and fair treatment (54%). 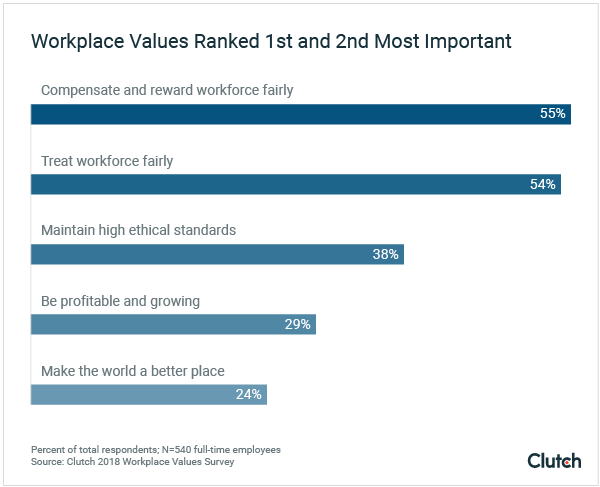 Over half of employees ranked these values as first- or second-most important among other values. Employees are less likely to rank other company attributes as first- or second-most important, including that the company maintains high ethical standards (38%), stays profitable and growing (29%), or makes the world a better place (24%). 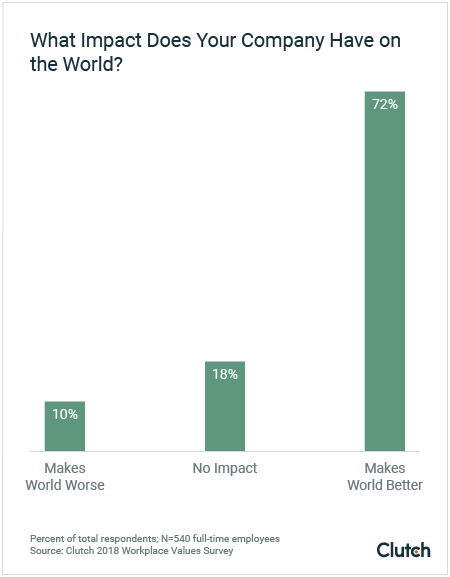 The majority of employees (72%) perceive that their company has a positive impact on the world. People work to make money. Unsurprisingly, our research shows that employees value fair pay (55%) more than all other workplace attributes. A salary reflects an employee’s perceived value within an organization. Employees want to be recognized for their performance through fair compensation. Workers who feel underpaid will lose their incentive to work and eventually quit. Almost 70% of workers cite low salary as the most likely reason to leave an employer, according to the HR and payroll company Paychex Worx. High wages attract high-quality employees, and fair pay ensures that they are motivated to work their best. Trends suggest that millennials are willing to work for less if given a chance to make an impact. Our research shows that money, regardless of age, is the primary driver when choosing an employer, though. The Deloitte 2016 Millennial Survey confirms that fair pay surpasses other workplace attributes, such as a company’s social impact. While all ages find competitive compensation the most important attribute, age does affect how important employees consider a fair wage. Our research shows that millennials (29%) value fair pay less than Generation X (32%) and baby boomers (42%). Older employees are more insistent that their skills and experience be well compensated. Fair pay also helps to offset the negative effects of workplace stress, which is on the rise. Employees are anxious about the current political climate, under pressure to adapt to new technologies, and fear losing their jobs to artificial intelligence (AI). Low wages further add to this stress. Companies must make fair compensation a top priority. Yet, trends suggest that companies don't always understand the importance of competitive pay. Management and employees differ greatly in the perceived importance of fair pay. According to a survey by risk management company Willis Towers Watson, employees consider low pay to be the second greatest source of workplace stress, behind inadequate staffing. Meanwhile, surveyed employers said that low pay is only the ninth greatest source of workplace stress. This discrepancy leads employees to feel overworked yet underpaid, says Shelly Wolff, senior health care consultant at Willis Towers Watson. “Employees seem to be saying, ‘support me, pay me, and direct me,’ but employers are focused on other stress factors,” Wolff said. As organizations expand the responsibilities of workers, they risk high rates of turnover unless compensation increases to match. For this reason, it’s crucial that employees feel like they have opportunities to advance. With a raise in sight, employers can better satisfy employees without immediately increasing pay. “Employees perform best when the environment is conducive to growth,” said Victor Lipman, whose work has appeared in Forbes. He is also the author of “Type B Manager: Leading Successfully in a Type A World.” Financial growth is most desirable, but personal or professional growth can substitute if times are lean. “I found many individuals highly motivated by loftier titles, added responsibilities, plusher offices, and the respect of others in the organization,” Lipman said. This means that companies can be creative about how they offer advancement to employees. Companies should always offer a fair wage, but opportunities for professional growth can help keep employees satisfied. With the U.S. economy relatively healthy in 2018, employees are voluntarily quitting their jobs at high rates, according to the HR consulting firm Mercer. To attract and retain the best talent without adding to payroll, companies must offer desirable benefits. According to a survey by the job search site Glassdoor, more than half of employees (57%) said that benefits and perks are a key factor in deciding whether to pursue a particular job. 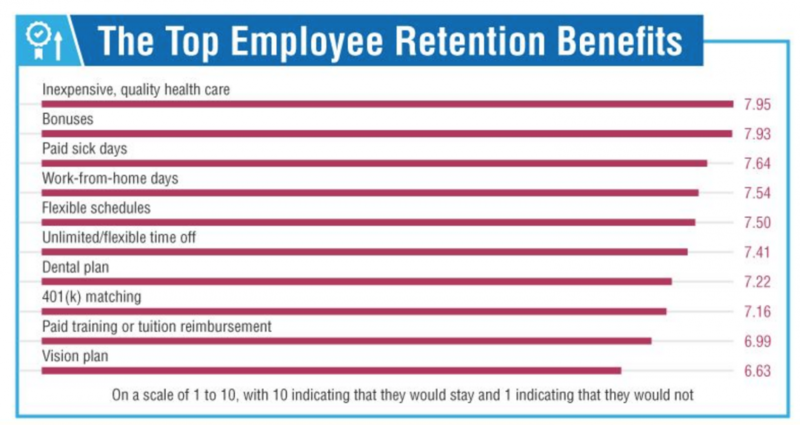 Though providing benefits can seem expensive, compare this to the cost of employee turnover. Replacing a single employee costs approximately 20% of that employee’s salary, according to estimates from The Center for American Progress. Replacing a single employee costs approximately 20% of that employee’s salary. Benefits cost money but reduce turnover, perhaps leading to more revenue for your company. Consider paid maternity leave, a widely discussed benefit in the U.S. The benefits of offering more than what the law requires are both attractive and financially feasible. Sonya Merrill of ZestFinance, an AI automation company, said that the cost of offering extended, paid maternity leave is sizable but ultimately worthwhile – especially if it can prevent an employee from leaving the company. Companies should align their benefits with their workforce. The easiest way to understand what employees want is to ask – whether via surveys or a one-to-one meeting. A study by the HR and payroll company Paychex Worx found the most sought-after benefit among employees is inexpensive, quality health care. Other priority benefits include bonuses, paid sick days, and work-from-home flexibility. These top benefits vary by age, however. For example, millennials value bonuses over inexpensive, quality health care, a trend that’s swapped for baby boomers and Generation X. Most of these benefits would otherwise be out-of-pocket expenses for workers. 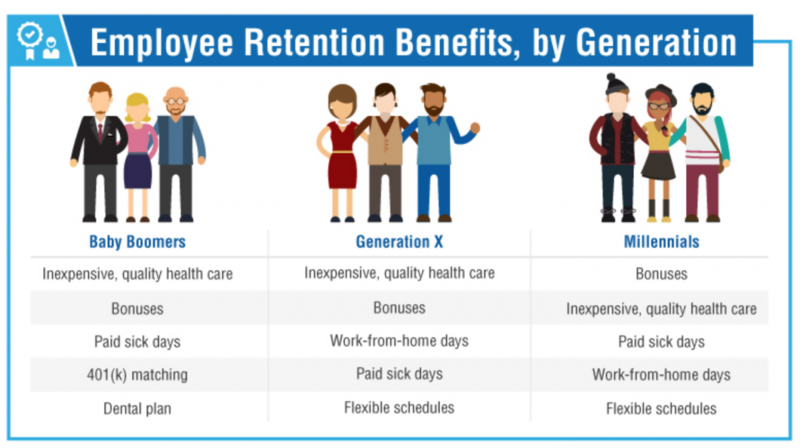 A desirable benefits package helps employees feel appreciated and lets companies demonstrate that they care. Workers know they’re worth more than money, so fostering an environment of respect is critical to employees’ performance and retention. Our research shows that 93% of employees think that being rewarded and compensated fairly is ‘very’ or ‘somewhat’ important, compared to 94% who think that fair treatment of the workforce is ‘very’ or ‘somewhat’ important. Workers who identify with a company’s values are more productive, innovative, and loyal to the organization. Equality provides the foundation for a happy, sustainable workforce. Lori Goler, head of people at Facebook, calls this the psychological contract of the workplace, or “the unwritten expectations and obligations between employees and employers.” Fairness is necessary for a high-functioning workplace. When a company lacks fairness, employees feel discouraged to participate beyond mandatory responsibilities. Employees who feel marginalized will become disaffected, disengaged, and resentful. The result is a toxic workplace that suffers from high rates of turnover. A culture of fairness closely correlates with how companies provide compensation. Mark Fulks, a labor and employment lawyer at Baker Donelson, discussed how compensation must be based on the work and skill of employees, not their demographics or privileges. Employers must provide the necessary resources to support employees. This means investing in employees who enter at a disadvantage, such as women and people of color. “Companies need to have a strategic framework...with goals, targets, sponsors, and support networks, and with clear leadership from the top,” Jane Nelson wrote recently in Fast Company. Nelson directs Harvard’s Corporate Social Responsibility Initiative. Inclusive businesses earn greater profits, but only if employees feel they’ve been encouraged to succeed within the larger group. Organizations struggle to implement initiatives that promote advancement for disadvantaged workers, however. Offering equal opportunities for advancement is key, as this demonstrates that everyone is rewarded according to their merit. Conversely, any unreasonable pay differences or failures to discipline or dismiss non-performers will demotivate staff and harm the work culture. To avoid any perceived unfairness and encourage positive morale, companies should make clear how they distribute benefits and privileges. They might also underscore the importance of fairness in a company meeting or via a series of emails from leadership. Encouraging feedback about fairness, either with anonymous surveys or through the compliance department, will help companies gauge whether employees feel they are being treated fairly. A fair and equal workplace encourages employees to stay and perform their best. People spend more time at work than anyplace else outside the home. Workplace ethics are critical because they provide employees with a sense of purpose and integrity. 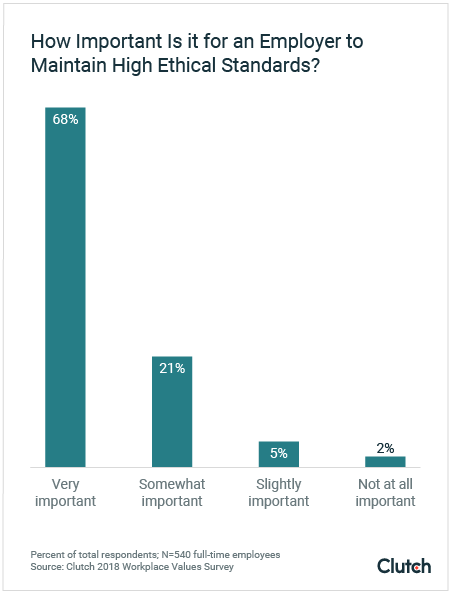 Our research shows that 68% of employees consider maintaining high ethical standards to be “very important”,” while 38% consider ethical standards to be a first- or second-level priority in the workplace. Workplace ethics are integral to employees’ well-being because it lets them feel proud and honest in their occupation. This is critical as people’s jobs are becoming a larger part of their lives. Integrity is a word that’s used loosely in corporate culture but is increasingly predictive of long-term success. “We've also seen time and time again that companies that don't act ethically don't stick around for the long term, and employees want to be a part of something that's built to last,” Doerr said. Ethical practices are more sustainable and help companies secure the most talented employees. “Certain firms are more likely to be chosen on principle rather than pay," said Jane Cote, academic director and associate professor at the Carson College of Business. Management should lead by example when it comes to ethics and integrity. Employees watch their leaders closely for signals of behavioral norms. An easy first step toward an ethical culture is to model the behaviors expected from all within the organization. “For most companies, efforts to improve culture start at the top with senior executives, ensuring they exemplify strong ethics in interactions and communications with their teams,” said Brian Lee, legal and compliance leader at Gartner. While management must inspire ethics, the greatest source of influence on employee ethics is from peers. According to Gartner, only 25% of employees trust their peers to model and practice the right ethical behaviors. The key differentiator between companies with strong workplace ethics and those without is a healthy company culture that promotes integrity. How Can Companies Promote Strong Ethics? Ethics might not always have been so important to employees. “It’s interesting to note that these results probably would have been different 10-15 years ago. The further back you go, the fewer employees would have cared (or they would have turned a blind eye perhaps) to their work’s ethical standards,” said Nate Masterson, CEO of Maple Holistics, a bath and beauty company. Greater emphasis on the need for equality in the U.S. overall has led to an increased need in the workplace. “With a rising awareness of the need for equality now, more than ever before, employees are looking to ensure their workplace is meeting their corporate citizenship and ethical standards,” Masterson said. To encourage ethical action, companies can tap the influence of key employees. A company with a strong code of conduct will attract and grow with employees of similar values. Jobs that provide a sense of purpose are increasingly valued. After all, we want what we do to matter. Despite this, a company’s social impact ranks as the least important of all workplace values. Only 24% of employees surveyed ranked that their employer makes the world a better place as the first- or second-most important workplace attribute. Surprisingly, a full 72% of surveyed employees already believe that their company makes the world a better place. Thus, social impact may rank low because most employees believe their company is presently making a difference. These employees are more comfortable putting priority on other workplace attributes. The desire to think of your job as part of a solution is reflective of a larger shift in culture, said Thea Ducrow, Ph.D. at Ducrow Consulting. “As Gen X and millennials are in positions of power, the importance of authenticity is coming to the forefront,” Ducrow said. Given the surging importance of corporate responsibility, organizations can benefit from aligning with social causes. Regardless of genuine impact, the perception of making a difference will enhance a company’s status with the business community, employees, and potential hires. Our research confirms that socially impactful companies are most valued by Generation X (22%), followed by millennials (21%) and then baby boomers (4%). This gap between the older and younger generations indicates a difference in values and practical realities. Baby boomers are less flexible in their careers and enjoy less job security. Gen Xers often have the time, dynamic skills, and mobility to pursue new career options. 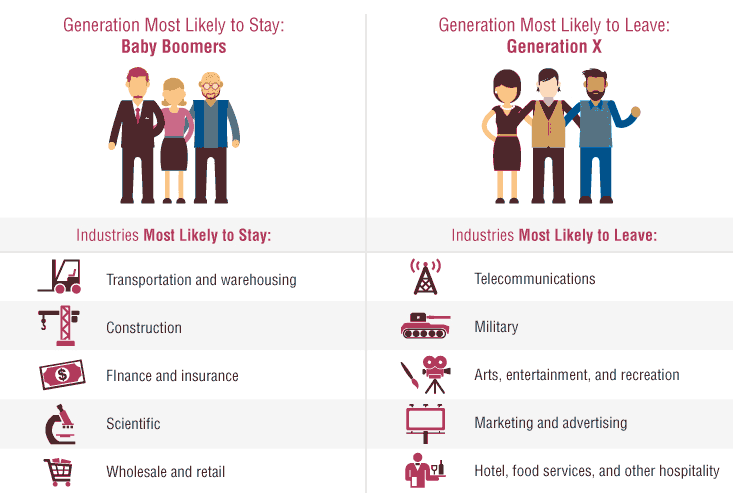 Gen Xers are the most likely to leave a job in favor of another position, while baby boomers are the least likely to leave, according to Paychex Worx. Be aware that impact is relevant to employees, but remember that a social agenda is no replacement for competitive pay. Employees value fair pay and fair treatment more than all other workplace attributes. This contradicts popular trends that suggest social impact is most important to workers. A competitive job market, coupled with the widespread assumption of social values among employers, finds workers selecting employment based on more traditional values. Generational differences exist, though. 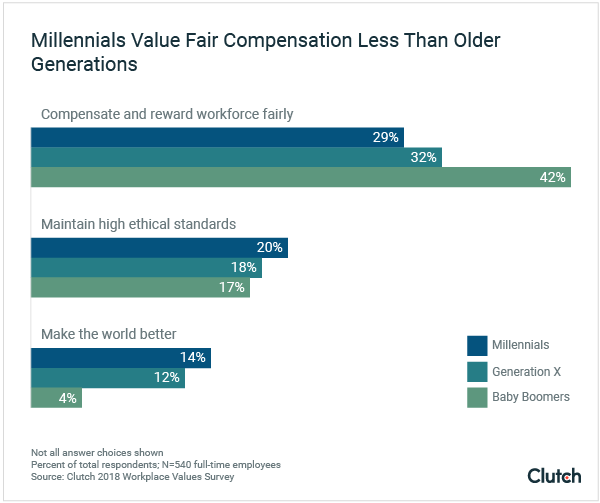 Baby boomers place the most emphasis on fair pay, while Gen Xers more heavily emphasize the social impact of a company. Companies must provide fair pay and fair treatment to attract and retain the best employees. Ultimately, employees who feel appreciated will perform in a way that bolsters the health and success of a company. Clutch surveyed 540 full-time employees of all ages and from businesses of all sizes. Respondents were split nearly evenly across millennials aged 18 to 34 (42%) and Generation X aged 35 to 54 (43%). Only 14% of respondents were baby boomers aged 55+. Nearly two-thirds of respondents (61%) were associates or managers at their companies. Females represented 60% of respondents.